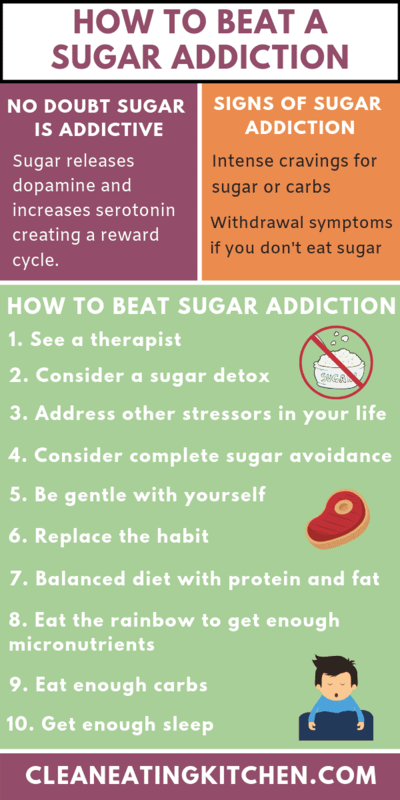 If you’re dealing with sugar addiction and can’t stop eating it, you need these ten tips to help stop the cravings and feel better. Before we get into tips to help beat sugar addiction for good, let’s discuss the reasons why it’s so easy to get addicted to sugar in the first place. Sugar plays a huge role in our lives. It is present in most processed foods and restaurant meals, even ones that don’t seem sweet. If you’re following a Standard American Diet or eating a lot of packaged foods, you’re over-consuming sugar. Even if you’re eating a healthy diet, you can still may have an issue with sugar addiction. 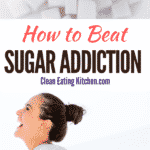 There is no doubt that for the majority of people, sugar can cause addiction-like symptoms. 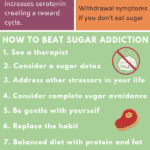 Obsessing over sugar, being unable to moderate your intake, and experiencing withdrawal symptoms without it are all good markers that you have an addictive pattern with sugar consumption. Quitting sugar is more than breaking a habit or a matter of willpower. Sugar addiction is more comparable to that of nicotine or caffeine addiction that that of a drug addiction. Others think that sugar addiction is a psychological addiction rather than a physical addition. However, that doesn’t decrease the significance of the addiction. Sugar consumption, like that of all hyperpalatable foods, triggers our brain’s reward system. A release of dopamine and a rise in serotonin associates these foods with pleasure, and rewires our brain to crave more of them to continue releasing dopamine. Intense sugar cravings. If you need something sweet to finish off your meal or experience a need for sugary snacks in the afternoon or at night, you might be fighting a sugar addiction. Thinking about sugary treats between meals and obsessively searching for new dessert recipes can be a sign of sugar addiction. Carbohydrate cravings and loss of moderation control.A sugar addiction can also manifest as intense carb cravings, such as wanting a giant bowl of pasta. Carbohydrates convert to glucose (sugar) in our bodies and have a similar reward effect in our brains. With addiction, one slice of bread doesn’t suffice–you need at least half the loaf. Withdrawal symptoms. If you experience irritability, headaches, a racing heart, stomach issues, muscle tremors, or sweating in the absence of sugar, those are signs of withdrawal. Addiction is a serious issue that should be treated with care and under the guidance of a licensed healthcare professional. But, these ten tips should help get you started on the right path for addressing your sugar addiction, stopping the cravings, and, ultimately, finding freedom. Having support is an important part of breaking a habit or addiction. A therapist can provide strategies to manage stress and make breaking your addiction a success. It’s also important to make sure that you don’t just go from one addiction to another. Working with a professional therapist is really important to help stay addiction-free. Quitting cold turkey from sugar may be overly stressful and even unsuccessful, depending on your unique personality. Having a gameplan with a sugar detox can help you be successful in breaking your addiction, and support your body as it rids itself of toxins. Learn more about how to do a sugar detox. 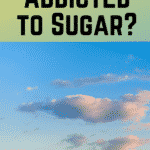 As with most addictions, sugar addiction is rarely about the sugar itself. There are likely underlying stressors or traumas that sugar consumption helps mitigate. Make it a point to be present with yourself and tune into your patterns. Do you always reach for sugar after a stressful day? Do you experience a craving after you encounter a trigger for a past trauma? Awareness is the first step. void sugary foods, limit natural sugars including high-sugar fruits and sweeteners, and eliminate non-caloric sweeteners as well–even stevia, monkfruit, etc. Sweeteners still activate your brain’s reward center. Learn more about what you can eat on a no sugar diet. Remember that you are breaking an addiction that is probably not even your choice–the majority of Americans are raised on sugar. You’re undoing years of programming. Be proud that you are undergoing this and improving your health. Celebrate the wins and support yourself during missteps. You don’t want to trade one addiction for another. Even if it’s an addiction to eating healthy, it’s still an addiction and inherently harmful. Instead, be mindful of the difference between a habit and an addiction. If it serves you, consider replacing dessert with an after-meal walk or a cup of herbal tea. 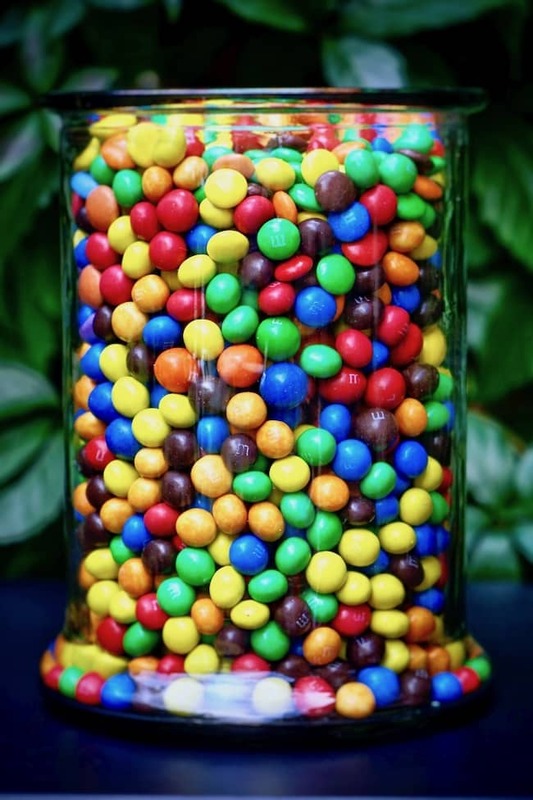 If you’re deficient in micronutrients, that can lead to sugar cravings. 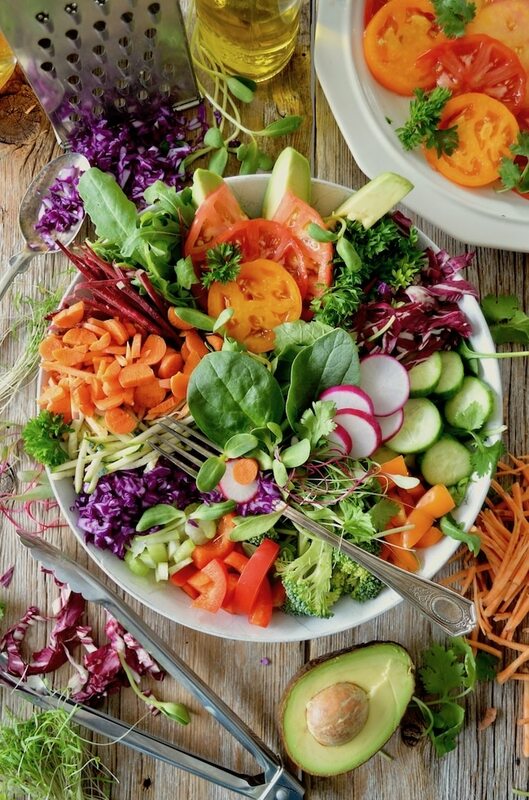 Eat a variety of foods, especially a rainbow of vegetables. Supplementation can also be a huge help to ensure micronutrient sufficiency. See my recommendations for the best supplements for women over 30 and women over 50. Fat and protein satiate our bodies and keep blood sugar levels stable. Eat a breakfast high in protein, and choose snacks that have a nice balance of protein and healthy fats. A balanced diet should lead to a decrease in sugar cravings. Undereating carbohydrates for too long can cause your body to crave starch and sugar to produce glucose. Choose complex carbs like sweet potatoes, brown rice, and lots of vegetables. If you’re undereating, your body reacts with sugar cravings for two reasons. One, your body believes it’s starving. Cortisol increases, causing you to seek hyper-palatable foods to quickly raise your blood sugar. Two, if you’re not eating enough, you’re also not eating enough micronutrients. Stress from cortisol increases also robs your body of micronutrients, specifically B vitamins and magnesium. Sleep deficiency reduces insulin sensitivity and increases stress hormones, which both contribute to imbalanced blood sugar and subsequent sugar cravings. Aim for 8-9 hours of uninterrupted sleep a night. If you are having trouble getting quality sleep, check out my helpful sleep hacks. How do you break a sugar addiction? The most important things when breaking a sugar addiction include having a gameplan and having a support system. This is an excellent time to examine your thoughts and patterns and how they contribute to your habits and any other addictions. Learn about yourself and your family’s history with addiction, and determine if you have an addictive personality. Following the tips listed can help you beat your addiction. What deficiency causes sugar cravings? Magnesium. Found in leafy greens, dark chocolate/cacao, and nuts/seeds. Vitamin C. Found in citrus fruits and cruciferous veggies. Trace minerals such as copper, chromium, etc. Found in whole foods and unrefined salts. B Vitamins. Found in animal products, most veggies, and some fruits like avocado and banana. I have a lot of empathy for anyone dealing with addiction, as I have experienced sugar addiction in the past. 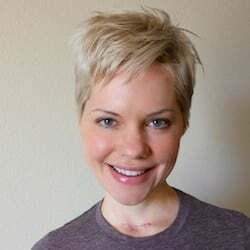 My addiction was in conjunction with an eating disorder, and it took a lot of work to repair my relationship with food and with sugar. 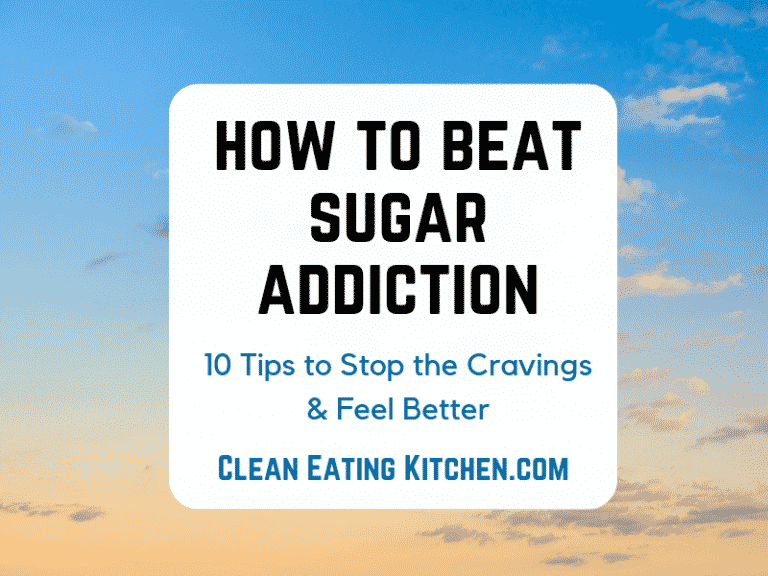 This post is part of a series I’ve done on sugar-free diets, including how to go sugar-free, what to eat on a no-sugar diet, how to do a sugar detox, and now this one on beating sugar addiction. I hope you find these articles helpful on your health journey. Don’t miss a post! Join my weekly newsletter list to get all the latest news and recipe links delivered directly to your inbox. You’re welcome, Melissa. I hope it is helpful. XO. « Instant Pot Chicken Recipes – All Gluten-Free & Dairy-Free!